"This is what you get when you give an 89 cents tip for an almost 30-minute drive," a man said in the video posted online. 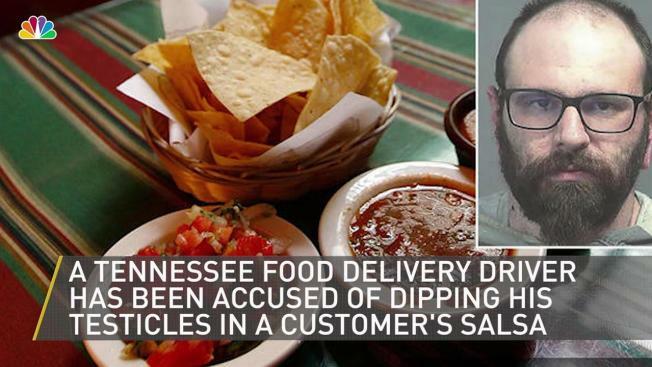 A Tennessee man was jailed on felony charges after appearing to dip his testicles into a container of salsa that a customer had ordered online. The delivery driver allegedly recorded it and posted a video online, "This is what you get when you give an 89 cents tip for an almost 30-minute drive." News outlets report that the passenger, 31-year-old Howard Matthew Webb, was arrested last week and charged with adulteration of food. Dinner Delivered said the food service has fired the driver and forwarded information about him to authorities as well. Webb remains behind bars pending a March 12 hearing. His arrest warrant says they picked up the food for delivery from a local Mexican restaurant. The company issued a refund for the tainted food.